April has been such a good month for me. It was my blogoversary and I can’t believe that I’ve been blogging a whole year now! I’d just like to thank everyone who tweeted me or commented to wish me a happy blogoversary because it really made me just want to hug you all! I hope you’ll be satisfied with a virtual hug! I’ve had a really good month reading wise and I’ve read a lot of brilliant books! So in total I read 15 books! I didn’t read as many as last month, mainly because I read loads last month and also because I didn’t read as many at the start of the month. I’m really pleased with the number though because the goal that I set myself was ten. Out of those, three of them were UKYA so I didn’t have a very good month in that sense. Oops! In other news, this month I became moderator of a Goodreads group called Teen Bloggers. If you’re a teen blogger then come and join the conversation because you’re sure to have a great time. I’m well on my way to reaching my end of year goal of 100 books and I’ve currently read 59 so I’m over half way. I really can’t believe I’ve read this many! In May (I can’t believe how fast the year is going!) I’m hoping to read at least ten books. This is quite low because I’m being loaded with homework at the moment and, although I try to read as much as possible it is quite hard to find the time. I’m not going to set myself any other goals this month because I don’t feel like I need to. I’m so happy with how everything is going at the moment and I don’t want to ruin it by putting too much pressure on myself. I hope you all have a brilliant May! What a awesome month. You read so many great books!! And again, congratz on the Blogoversary. The Teen Bloggers Group is seriously the best, isn’t it? Have a great May! Blood Red Road was decent to me… But I admit that it was full of tension… I’m planning to read Paper Towns in this week or next week maybe. I hope I’ll enjoy it 😉 Good luck completing your goal, Lucy!! 😀 Have a nice month! I couldn’t even finish reading your #1! I didn’t like it because all of the sudden she was this killing machine and… where did that come from? Wow! well done. Impressed with your list. I hope you reach your goal for May. Looks like you had a great month! 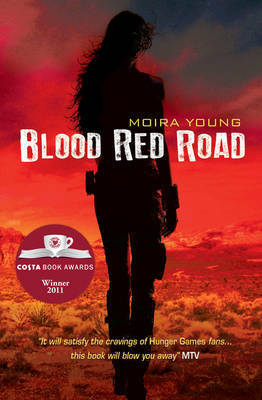 I really need to read Blood Red Road! You have read some fantastic books! I’m so excited to read You Don’t Know Me by Sophia Bennett and get me hands on Blood Red Road. I’ve been admiring it for months. The Elite is still on my wish-lists! I just need to read it! So glad you had a good month Lucy!